After a nearly two-year hiatus, baseball analysis is returning to Rational Pastime in the form of another round of MLB postseason projections. Thank you for stopping by. Let's get down to it. This year, the numbers favor the Boston Red Sox and the St. Louis Cardinals, projecting a rematch of the 2004 World Series. My projections give the BoSox 4:1 odds to win the Fall Classic, followed by the Cardinals at 5:1, the Oakland Athletics and Detroit Tigers at 15:2, the Tampa Bay Rays, Atlanta Braves and Los Angeles Dodgers at 10:1, and the Pittsburgh Pirates bringing up the rear at 11:1. What numbers, you ask? I'm getting to that. Since the AL won the 2013 All-Star Game, they will have home field advantage in Games 1 and 2 and, if necessary, 6 and 7. Naturally, this bolsters the chances for AL squads and depresses them for the NL--but not as much as you may think. Since home field advantage in baseball is only ~10% in interleague matchups, and because the net difference is only one game in seven, the best AL teams will only enjoy about a 1-2% increase in their chances of taking home the Commissioners Trophy. The AL as a whole is ~3% more likely to win it all, and the NL ~3% less likely. Beyond the jump, I briefly explain the rating and projection systems and discuss series breakdowns. As in the past, my projection system employs the Log5 method to simulate each game in every possible series. The Log5 formula takes as input talent levels of two teams (between .000 and 1.000), adjusts for home field advantage, and produces as output the probability that either team will win. These projections will assume a home field advantage of .533 for division match-ups, .542 for intraleague match-ups and .551 for interleague match-ups, as recommended by research from Matt Swartz. In a major departure from my projections in previous years, I shall not be relying on outside data to establish a team's true talent level. Instead, I have developed an in-house rating system based on Elo Ratings. By using my own rating system I can update ratings as teams progress through postseason play. I will discuss the rating system in depth going forward--truly, it deserves its own post. The numbers my system projects will differ from the Vegas line. Is it likely that any system will outperform Vegas in the long run? No, the efficient market hypothesis explains why that is unlikely to happen. This is not a system designed to beat Vegas. It is an experiment that tracks variations in projected success in response to previous successes and failures (and an excuse to produce colorful graphs). If it concerns you that these odds are not Vegas odds, you should probably stop reading now. Final rankings are based on a weighted average of each team's Elo-based expected win percentage and their Pythagenpat expected win percentage (the former weighted twice as heavily). Because the AL performed better in interleague play, AL teams get a boost according to the same formula employed by Baseball Prospectus (which amounts to .007 at the moment; original citation seems to be missing from web), while NL teams suffer an equal penalty. Peruse the ratings for each MLB team (eliminated teams in grey) in the table below. As in the past, this projection system will not take into account micro-level team data, such as playoff rosters, rotations, platoon advantages, et cetera... If you're looking for a projection system that does take these data into account, I would suggest you acquaint yourself with Xeifrank's work at Dodger Sims. 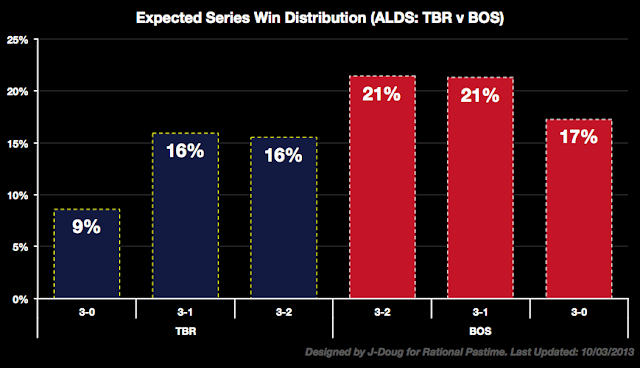 The system heavily favors Boston to topple Tampa Bay in the opening series. At 60% to win the ALDS, the projection system is more optimistic about a Boston sweep than it is about any outcome that sends Tampa Bay to the ALCS. The other ALDS series is far tighter. As you may have noted above, Detroit and Oakland are only separated by .004 in the rating system, with Detroit actually ahead. Regardless, Oakland finished with the better win-loss record. The Athletics' home field advantage cancels out the Tigers' slight edge in estimated talent. It may as well be a dead heat. The A's are favored 51%-49% over the Tigers. 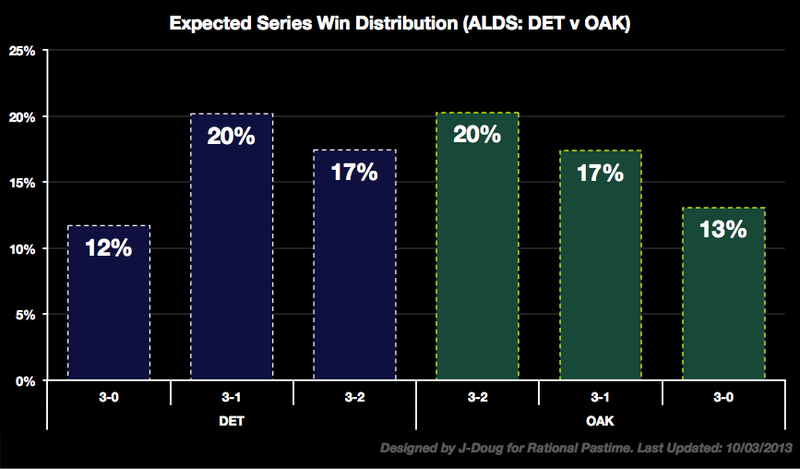 Home field is playing such a large role in this projection that the odds of an Oakland win in 5 are nearly even with the odds of a Detroit win in 4 (and the odds of an Oakland win in 4 are equivalent to the odds of a Detroit win in 5). Put another way, the best chance for the Tigers is to win it at home (games 3 and 4 will be played in Detroit) and prevent the series from returning to Oakland. The dynamics of the Pirates' first playoff series in over two decades are, unfortunately for the Bucs, very similar to the Sox-Rays ALDS. 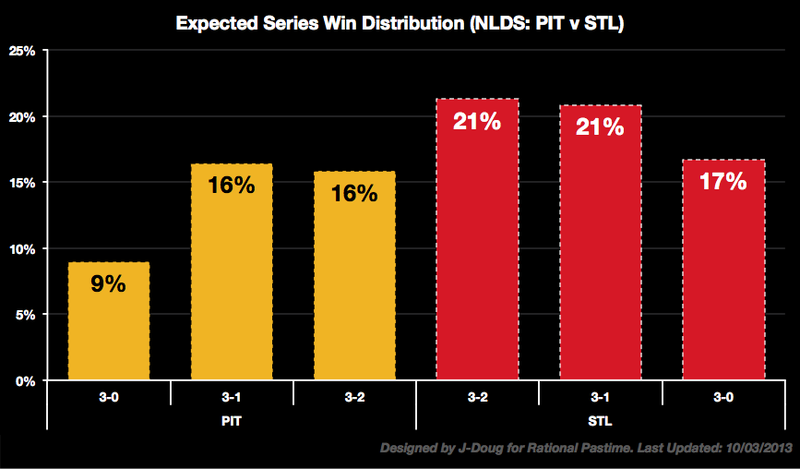 The Elo system heavily favors the Cardinals (St. Louis is the top ranked NL team while Pittsburgh is the lowest ranked of all playoff contenders) and home field advantage only amplifies their chances of victory. At 59% to advance, the projection system finds it more likely that the Cards will sweep than it does that the Bucs will advance at all. Pittsburgh's best chance is, as you would imagine, to prevent the series from returning to St. Louis for Game 5. Finally, we come to the second closest match-up among the League Division Series. As in the Oakland-Detroit series, home field plays a major role in the evenly matched Dodgers-Braves series. 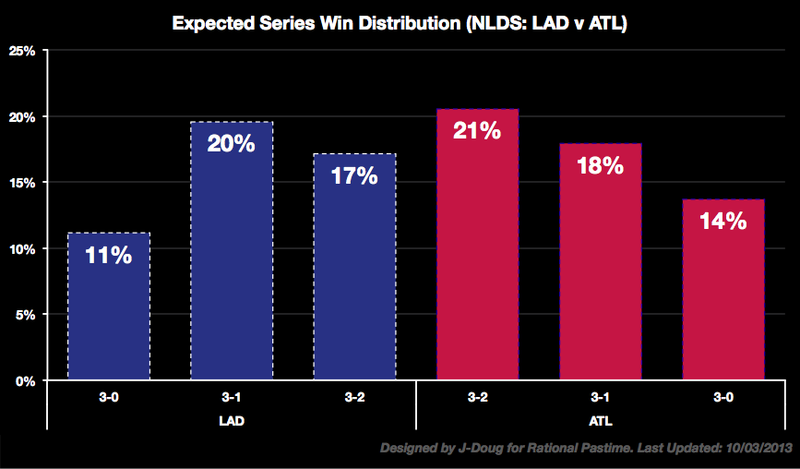 The modal outcome is a Braves victory in five games, followed by a Dodgers victory in four. 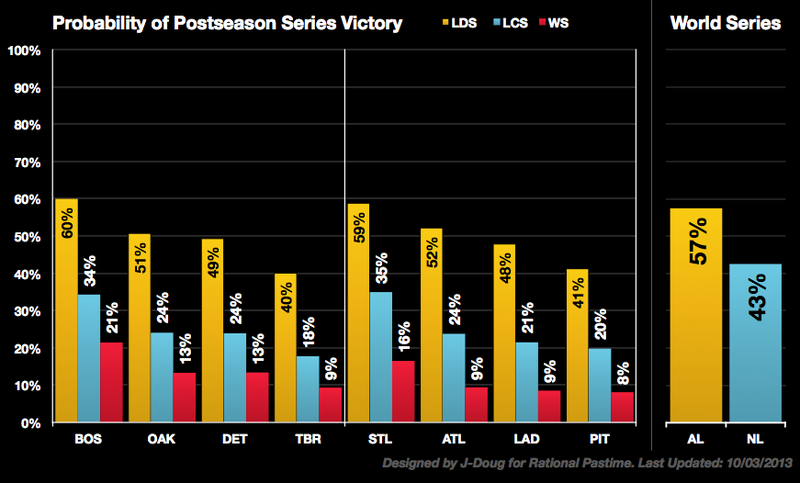 I shall be updating these figures and charts following every night of playoff baseball. Stay tuned, and thanks for checking in with Rational Pastime once again. It's great to be back.